A cleft sternum is a rare congenital anomaly often diagnosed as asymptomatic at birth. Clinical outcome may be unfavourable when an associated anomaly, particularly, an intra cardiac anomaly coexists with the defect. Primary repair should be employed in the neonatal period because the flexibility of the chest wall is maximal and thus the compression of underlying structures is minimal. However, patients with sternal cleft may even present late in the childhood or adolescence period. We herein report two cases of successful repair of sternal clefts with review of the available literature. Congenital midline cleft of sternum is a rare developmental anomaly, usually occurring as part of a defined syndrome, e.g., Cantrell's Pentalogy. Isolated sternal cleft without any associated anomaly is very uncommon. It results from failed ventral midline fusion of the sternal bands, which normally occurs during the first 3 months of embryonic life. 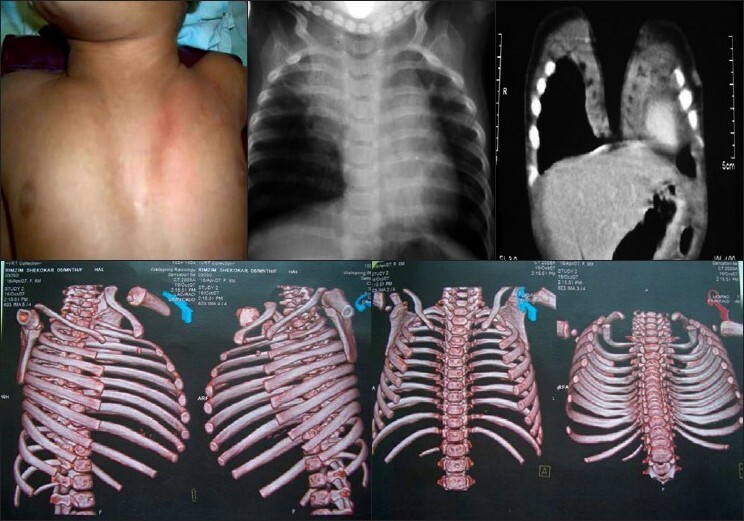 , Isolated sternal clefts present in early infancy because of the obvious cosmetic deformity. The anomaly is more common in females and the association with midline supraumblical raphe and facial haemangiomas is well known. Surgical treatment in the newborn period is preferred as the chest wall is pliable and the thoracic viscera accommodate easily to the closure of the chest wall. We present our experience with neonatal surgical repair of subtotal isolated cleft sternum. A 6-month-old male patient was admitted with h/o recurrent episodes of bronchopneumonia with a midline thoracic bulge, evident during expiration and crying. During inspiration, a depression appeared in the same area. On admission the neonate was asymptomatic. Observation and palpation allowed us to diagnose a 4.5-cm wide U-shaped, sternal cleft. The diagnostic image was consistent with the clinical evaluation: a chest roentgenogram showed the typically widely separated clavicles and absence of manubrium and of ossification centres of the sternum [Figure 1]. The electrocardiogram and an echocardiogram of the infant were normal. Subsequently, primary closure of the defect was performed. Through a midline cevicothoracic incision, the sternal bars were dissected free from the insertion of pectoralis major muscles anteriorly and from endothoracic fascia. The resection of inferior sternal portion is done to get "V" transformation of the "U" defect. The pectoral muscles joined in the midline, and the edges of the bars were then sharply freshened, and multiple encircling non-absorbable sutures were passed through intercostal spaces [Figure 2]. A penrose drainage was left under the skin flaps and the skin closure was performed with absorbable subcuticular sutures. No per-operative complication occurred. The patient started feeding at 8 hours postoperatively. The antibiotic was stopped after taking out the drain. The patient was discharged 5 days after repair. Our second patient was a 15 day-old, full-term male baby weighing 2.5 kg, who had normal Apgar scores at birth. The parents had a similar complaint of midline chest bulge on crying. He had a midline 'U'-shaped sternal cleft [Figure 3]. There was no other obvious congenital anomaly present. The Doppler echocardiography was normal. The patient underwent sternal repair on the 18 th day of life. The sternal bars were exposed and the pericardium and pleura separated from the undersurface. The edges of the sternal bars were mobilized and approximation was achieved by prolene sutures inserted through the intercoastal spaces. The patient's haemodynamic status was monitored for 5 min before tying the knots. The patient had a haemodynamically uneventful postoperative recovery. At a follow-up visit, the child was seen to develop facial haemangiomas. Oral betamethasone was begun. The patient has completed 1 year of follow-up and is doing well. The resultant anatomical defect produces a concave defect in the sternum covered by skin, with an orthotopic heart and an intact pericardium. The skin moves paradoxically with intrathoracic pressure changes [Figure 1]. The shape of the defect can vary from a narrow 'V' to a wider 'U'-shaped cleft. The sternal defect, if partial, involves the upper sternum and manubrium, in contrast to the sternal defect in thoracic and thoraco-abdominal ectopia cordis, in which the defects are mostly in the lower sternum. The clinical presentation due to the defect is bulging of the skin with crying as seen in both of our patients. Mostly these infants with ectopia cordis are asymptomatic. Recurrent respiratory tract infection can occur due to reduced aeration of lungs due to associated decrease in the thoracic cavity space. If the anomaly occurs as a part of upper midline syndrome, e.g., Cantrell's Pentalogy, then associated diaphragmatic and pericardial defects are also present. Fischer  reported an association with cervico-facial haemangiomas in 1879 and Ingelrans and Debeugny later reported occurrence of fatal post-operative haemorrhage from presumed haemangiomas of trachea. The timing of appearance of haemangiomas is variable and parents should be informed before surgery. 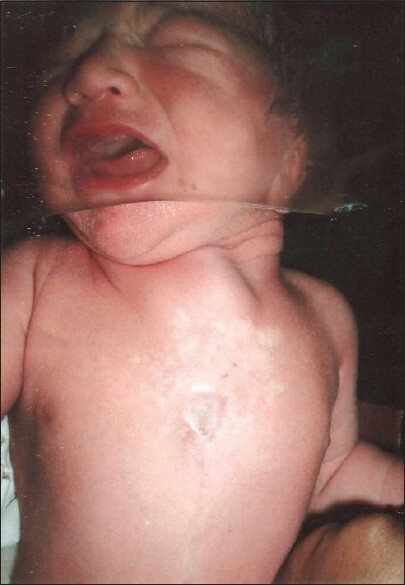 Other associated conditions are supraumblical raphe, band-like scars extending from umbilicus to the inferior aspect of the sternal defect, and rarely a split mandible (gnathoschisis). Intracardiac anomalies are rare in cases of sternal cleft, a distinction from the other sternal defects. The flexibility of the thoracic cage is inversely proportional to the age of the patient. Repairs done after the age of 3 months have always required more supportive postoperative care with higher incidence of cardiac complication. Beyond 1 year of age, autologous rib/coastal cartilage grafts/prosthetic materials are required. Good mobilization of the two sternal edges is the key to a secure approximation. Wedge excision of the xiphoid process is required to approximate the lower edges. All the peristernal sutures are placed before tying the knots [Figure 2]. Hemodynamic stability is reassessed by the anaesthetist and after approximation the knots are tied after waiting for a brief period. The patient is to be watched in the early postoperative period. The risk of complication decreases with the early age of repair. 1. Shamberger RC. Chest wall deformities. In: Ashcraft KW, Editor. Pediatric Surgery. Philadelphia, Pennsylvania: WB Saunders 2000. p. 248-51. 2. Greenberg BM, Becker JM, Pletcher BA. Congenital bifid sternum: Repair in earlyinfancy and literature review. Plast Recons Surg1991;88:886-9. 4. De Torres JI. Extract of a letter from Jos. Ignat. De Torres, MD to the Royal Society, containing the extraordinary case of the heart of a child turned upside down. London: Philosophical Transactions; 1739:41;776-8. 5. Burten JF. Method of correction of ectopia cordis. Arch Surg 1947;54:79-84. 6. Lannelongue M. De l'ectocardie et de sa cure par l'autoplastie. Ann Medico-Chirurgicales 1888;4:101-7. 7. Fischer H. Fissure sterno congenita mit partieller bauchspalte. Dtsch Z Chir 1879;12:367-9. 9. Shamberger RC, Welch KJ. Sternal defects. Pediatr Surg Int 1990;5:156-64. 10. Dςmini M, Cupaioli M, Rossi F, Fakhro A, Aquino A, Chiesa PL. Bifid sternum: Neonatal surgical treatment. Ann Thorac Surg 2000;69:267-9. Aland, N.I.J., Pawar, S.U., Tilve, G.H. Torre, M., Rapuzzi, G., Carlucci, M., Pio, L., Jasonni, V.